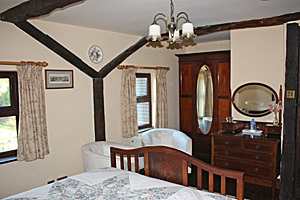 The large double bedroom is full of "cottage charm" with exposed beams and lovely rural views over fields on two aspects. 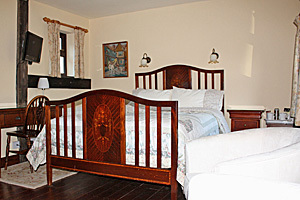 It is furnished with a beautiful antique inlaid mahogany bedroom suite, together with rosewood bedside drawer units from "Feather & Black" “, a reclaimed dark wood desk and two comfortable tub chairs, which provide a tasteful blend of old and new. In common with all guest bedrooms, there is a wall mounted TV with Freeview, WIFI access, provision for desk top working, a hospitality tray with selection of beverages and plenty of electrical sockets. There is ample hanging and drawer space for clothing and personal items. 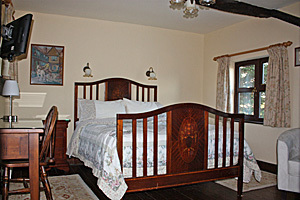 Bedding is to high specification and non-allergenic, including "Spundown" duvets, pillows and quilted mattress enhancer. 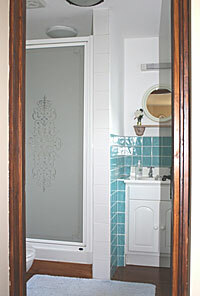 The bright ensuite bathroom has a large shower cubicle and a UK/US shaver socket over the vanity unit. 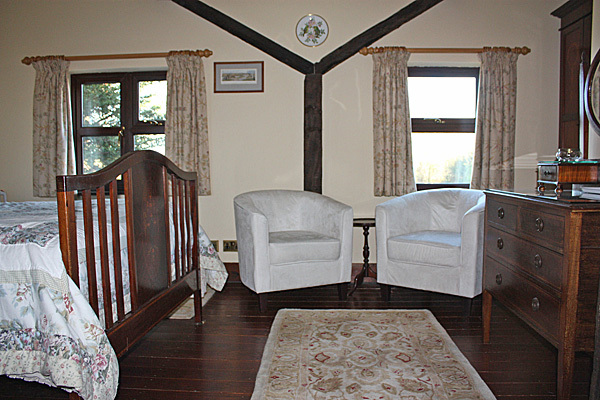 Guests are provided with ample towels, soap and shower gel.